← Cowboys, bison and grizzlies… oh my! Arrived in Jackson Hole today and so far love it. The first day of driving, Friday the 1st, was a bit tough, as I’d had only 5 hrs sleep the night before and was wiped out. AJ and I stopped in Spokane the first night, where I got my new MacBook Air and we made the most of some time out of the car, in a fun city. We may stop there en route back. Can’t deny some misgivings when I had to pull of the hwy on the way and take a nap, outside a farmhouse. AJ listened to David Sedaris‘ Me Talk Pretyy One Day, while I snoozed in the hot eastern Washington heat. A second nap came at a rest stop, where I woke drooling on the grass. AJ pointed out that it occurred to him, while I dozed on the grass, that this was how kids like him were grabbed and sold in to slavery… mother of the year. We made it just outside Coer D’Alene, ID after dinner, and crashed at a Best Western. Next day we made great time and took a detour to the National Buffalo Refuge in Moiese, Montana. Cool place with beautiful scenery and not enough buffalo to thrill mama bear. For a change, AJ was the glass half full member of our party and he felt that a herd of 15-20 was great! I was looking for a Dances with Wolves moment when all those tatonka would appear over the hill. Not in the cards. We managed to find one lone buffalo, about 100 ft from the road, rocking mysteriously back and forth and breathing heavily. We thought we’d lucked upon a female giving birth, and settled in to watch the amazing moment when the calf arrived. Nope, just a lone bull, rubbing himself against a big rock. That was the thrill of the day, as the rest of the “thousands of buffalo” could only be seen from a significant distance and were mostly lying around in the heat. No Kevin Costner moment, but AJ loved it. As the roads were empty and the gravel road easy to drive, and we were in Montana (where kids seem to drive by 6), I pulled over and offered to let AJ have his first try at driving a car. This came as a shock initially, but he got past his nerves and eventually took the wheel. Within minutes he was taking the curvy road at 30 mph (which frankly, did feel a bit fast) and grinning like a Cheshire. I kept telling him how well he was doing and just when he was getting a tad cocky and believing that he could actually handle the beast, he realized that we had gained quite a bit of elevation and there was a considerable drop off the one side. This was enough to remind him that maybe drivers ed would come in handy and he let me take the driver’s seat back. A shiny moment for both of us, on our grand adventure. 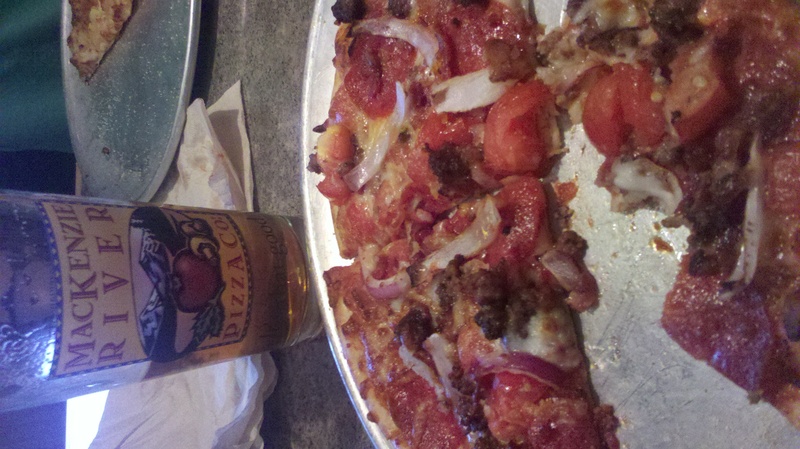 We drove on to Bozeman and had to really scramble for a room to sleep in, night 2… we made the mistake of having the best pizza (and a micro brew for me) at Mackenzie River Pizza Co. The dinner was great, but when done, all rooms were gone. We ended up driving back up the hwy, stopping at exit after exit and finally staying at a place that gave AJ the willies, though it turned out just fine. Note to self: room first, food second from now on. Today, Bozeman to Jackson Hole was endless vistas and wide open roads, where I could take the baby up to 85, easily. We missed the west entrance of Yellowstone (too much podcast, not enough GPS), but managed to hit a section of the park anyway, as well as the Teton pass. Hit Jackson Hole just in time for dinner… Cadillac Steakhouse got me my cocktail (hello, much needed by then! ), a 16 ounce porterhouse (and yes, I ate it all) and scored AJ the kickass burger he’s been waiting for. Everything comes down to “my last” right now for him: My last soft bed for 2 wks; my last burger; my last day with a shower; etc He’s nervous and excited all at once, but more nervous. I don’t want to give him false optimism, but am trying to reassure him that this will probably go very well and end up being one the great adventures of his life. There will be bigger, better ones, no doubt… but the ones you have in your childhood, as with so many experiences, are often elevated to magical heights. We tend to remember the good and bad of our youth in mythical proportions. My honest belief is that when all of these kids are out there in the wilderness, the cliques and other stuff falls away and they will all bond. AJ is definitely an odd kid, by many 15 yo boy standards. He’s prone to crazy accents (done well I might add), silliness, and hyper energy. He’s been diagnosed with severe ADHD and his energy level is definitely something to be reckoned with at times. Just the same, he is also one of the nicest, sincerest, fun kids I know. When given a chance, I think he will find that he has strengths that he doesn’t know he has. This is what I hope for him. Right now, his nerves have the best of him and I think tomorrow will be a bit tough for him. As the time comes, I can’t deny some ambivalence of my own. This is a free fall. I really don’t know what I plan to do for the next couple weeks… if I last that long. I like Jackson Hole so far and will probably spend a few days here to start. I need to find the right place to stay though. In my mind, I’ve pictured a bubolic place, with a river and privacy, near town. If I could find the right place in town, where I could sit at cafes and soak in the local scene, I’d sacrifice the river. I also want to drive back to W. Yellowstone and find a similar place to hang for a few days while I explore the park by day and write and take in the local flavor by night. The other thought is a dude ranch. I’ve missed riding and would love to hang on a farm for a while, ride and be around a barn again. A day of white water rafting is on the list as well. However, aside from these images, I have no actual plan. I have nothing booked, and no plans set yet. It’s both scary and exciting… as the possibilities seem endless and totally limited, depending on my own motivation and drive. I drop AJ at the Jackson Hole airport at 2:45 tomorrow and the free fall begins. It will be a whole different adventure without my co-pilot, but I think I’m ready for my solo flight. Bring on horses, giddy up. This entry was posted in Mothers, Natural beauty, Parenting, travel, traveling alone, Yee haw and tagged Adventure, bison, free falling, Jackson Hole, kids at camp, traveling alone. Bookmark the permalink. 1 Response to Giddy up.